In this comprehensive reference manual regarding Sedona Framework, components from Tridium-release kits are explained along with Contemporary Controls’ hardware-independent and hardware-dependent kits. Examples are shown on how components can be configured and linked to create applications. To use Niagara Workbench AX as a Sedona Tool to program your BAScontrol or BASpi, your computer must have a copy of either Workbench 3.7 or 3.8 and must also have a proper installation of Sedona Framework and the latest Component Bundle - both provided by Contemporary Controls as a download below. The Niagara Workbench tool can be used to create wire sheet applications on a Sedona compliant controller such as the BAScontrol, BASpi, or BASremote platforms, assuming Sedona Framework is installed in the tool. If in Workbench you can do a File > Open > Open Device operation, then Sedona is installed. If not, you can install Sedona Framework into Workbench by following the instructions in our video entitled Installing Sedona Framework and Kits. 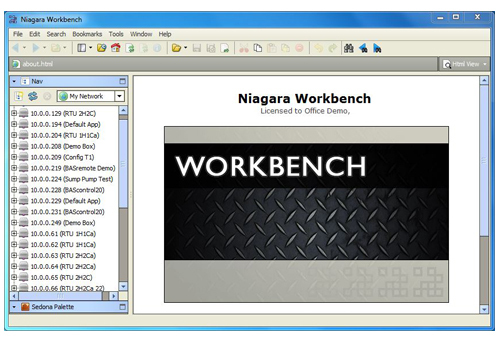 The Niagara Workbench tool may come with different vendor names depending upon where the product was obtained. Sedona Framework is provided in one zip file and can be loaded into Workbench versions 3.8 or 3.7. There are different installs for each version so make sure you download the proper version for your tool. Watch the video and follow the instructions. Once Sedona Framework is installed go to the second step in the process entitled Adding Component Bundles to the Workbench Tool below. *Note: Do not unzip file. File must remain zipped to function. **Note: This method works for Workbench 3.8.111 or earlier. For Workbench versions later than 3.8.111, contact our tech support for steps on how to install the Sedona component bundle in your Workbench AX tool. A Sedona controller has a particular personality that describes its features and capabilities. In the jargon of Sedona Framework, a controller is described by its Platform, Kits - consisting of components - and Manifests. We simply use the term Kits to describe this personality and the term Component Bundle to indicate what actually must be loaded into the Workbench tool so that the tool understands the personality of the Sedona controller to which it is connected. The Component Bundle contains Tridium 1.2.28 release kits, Contemporary Controls hardware-independent kits, Contemporary Controls hardware-dependent kits, and comes as a zip file referenced by a version number. As more capabilities are added to Sedona controllers in the form of additional kits or revised kits, a new Component Bundle will be created that reflects the capabilities of current and former versions of Sedona controllers. The component bundle version number will then be incremented. To install a component bundle into the Workbench tool follow the instructions in the video entitled Installing Sedona Framework and Kits.